Click the Like Button to receive a Facebook update every time when a new magazine is released. Different specimens require different preparation techniques. Web pages to check out! What’s going on on the web? 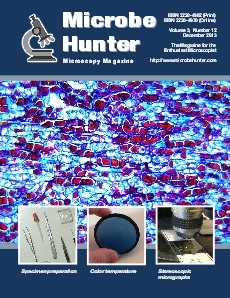 Here is a summary of microscopy related publications. One possibility is to tilt the slide to make stereoscopic twin images. Blue filters can be used to correct the color temperature. What are the pros and cons of concave microscope slides?